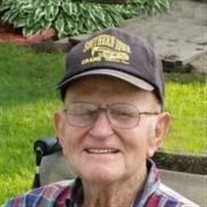 Floyd R. Hulbert, 94 of Oskaloosa and formerly of Truax, died Sunday, February 10, 2019, at Northern Mahaska Nursing and Rahab in Oskaloosa, Iowa. He was born May 27, 1924, in Mahaska County, Iowa the son of Alfred H. and (Myra) Verne Heaverlo Hulbert. Floyd attended country school in Mahaska County. He met the love of his life, Ethel Van Klootwyk in high school and waited for her to graduate before getting married on February 6, 1950. To this union 3 sons were born, Terry, Dan and Kelly. Early on in his life, Floyd helped his dad farm until he enlisted in the United States Air Force and served his country. He served as an M.P. and was stationed overseas in the North African Theatre from February 1944, until December 1945. After being honorably discharged, he went to work operating heavy machinery. He started out working at concrete materials and later for Angus Coal and other various places before taking a job with the Mahaska County Highway Department in 1947. He was instrumental in the management of secondary roads in Mahaska County. He retired as a heavy equipment operator in 1986. In retirement, he worked with Hulbert Contracting and mowed the Cargill Plant in Eddyville until he retired at age 88 due to ill health. Floyd was a family man who would always put others first. He always led by example and had a “do it right the first time” philosophy and believed in teaching by example. He enjoyed his career as a heavy machine operator. He also enjoyed passing down his mechanical knowledge to his children. He took great pride in keeping the Cargill Campus in Eddyville looking like a park and always keeping his tractor in tip top shape. He also liked country music and watching westerns. His real joy in life was spending time with his children, grandchildren and other family and friends. His family includes his wife of over 69 years, Ethel Hulbert of Truax; three sons: Terry Hulbert of Truax, Dan (& Diane) Hulbert of Cedar, and Kelly Hulbert of Blair, Nebraska; three grandchildren: Chris Hulbert, Jessica (& Marc) Nollen and Dr. Travis (& Katie) Hulbert; five great grandchildren: Gabrielle Hulbert, Eli Nollen, Parker Nollen, Teigen Hulbert and Koeyn Hulbert; and a sister-in-law (Fred’s widow), Geraldine Hulbert of Oskaloosa. He was preceded in death by his parents; two brothers: Cecil Hulbert and Fred Hulbert; and a sister, Goldie Haggard. Funeral services will be held at 10:00 a.m. Thursday, February 14, 2019, in the Bates Funeral Chapel in Oskaloosa with Revered Rodney DeRonde officiating. Burial will be in the Weldon Cemetery in southwest Mahaska County. The Bates Funeral Chapel is in charge of the arrangements. Visitation will begin Wednesday after 12 noon in the Bates Funeral Chapel and the family will be at the funeral chapel from 5-7 Wednesday evening to greet friends and relatives. Memorials may be made to the Wounded Warriors project or the Faith Community Church of Eddyville. To send flowers or a memorial gift to the family of Floyd R. Hulbert please visit the Bates Funeral Chapel Sympathy Store. Posted by Press Release on Feb 11 2019. Filed under Obituaries. You can follow any responses to this entry through the RSS 2.0. Both comments and pings are currently closed.